In our NewsHour Shares moment of the day, a Northern Virginia startup is using new technology and a sense of humor to care for the elderly. The NewsHour’s Teresa Carey reports. A Northern Virginia startup company is using new technology, and a sense of humor, to care for the elderly. The "NewsHour"'s Teresa Carey went to Fairfax, Virginia, to meet RUDY the robot. Olga Robertson has lived in her house for 57 years. With a large Italian family, including two daughters and grandkids, Robertson's home has a lot of memories. I'm here by myself most of the time, but I feel comfortable here. That's why I don't want to go into a home or anything. But despite being a spry 88-year-old, Robertson has an in-home caregiver who visits every day. She helps me do a lot of things. She will take me places, like to my doctor's appointments. She even does word puzzles with me. In March, to supplement her home care assistant, Robertson was given the opportunity to try RUDY, a robot designed by Anthony Nunez, CEO and founder of INF Robotics, a Northern Virginia start-up. Nunez hopes RUDY will help prolong seniors' independence. He built in features where caregivers, emergency responders, or family can check in remotely through a Skype-like interface, and steer RUDY through the home in search for the senior. And, as with any technology, there is a learning curve. Nunez created RUDY because of what he witnessed growing up. My grandmother fell down when she lived alone up in Rhode Island and ended up losing her independence. She ended up moving into my home. And, as a teenager, I watched my mom take care of her. And I kind of saw both sides of it at an early age. I wanted to do something about it, because I know that situation is not uncommon. But Nunez and his creation RUDY have a sense of humor. My first job was looking at an orange juice factory, but I got canned. Play games, and even dance the Jitterbug. But for Robertson, the best feature is companionship. You can talk to him all day, and he responds to you. It was good to have somebody to have a conversation with. Let's put it that way. A Brigham Young University study showed that when it comes to the impact on lifespan, loneliness is equal to smoking 15 cigarettes a day. Other robots, such as PARO robot pets, or ElliQ, are similar to RUDY, providing companionship or relaying information between seniors and their caregivers. Cliff Glier, CEO of SenCura, a non-medical home care agency, is one of the early adopters of RUDY. Older adults that live alone, having a robot overnight is less expensive than having a real caregiver stay awake and sit by their bedside. At $100 per day, Glier offers RUDY in conjunction with his home care services, using RUDY to check in on seniors through video chat. We here at the office will check in to the home up to three times a day, and more if need, check in to make sure everything is OK. Have you taken your medications? Have you gotten up and walked around? Oh, you look nice today. We're checking in without having to drive over and send a caregiver in to ask those basic questions. Some evidence suggests that nothing replaces the human touch, but because recent generations are having fewer children, there could be a shortage of people who will be available to care for the growing senior population. With four prototypes in use in the Washington, D.C. area, and more on back order in New York, San Diego and Boston, RUDY is an example of how robots could become a part of caring for seniors. 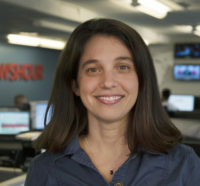 For the "PBS NewsHour," I'm Teresa Carey in Fairfax, Virginia.